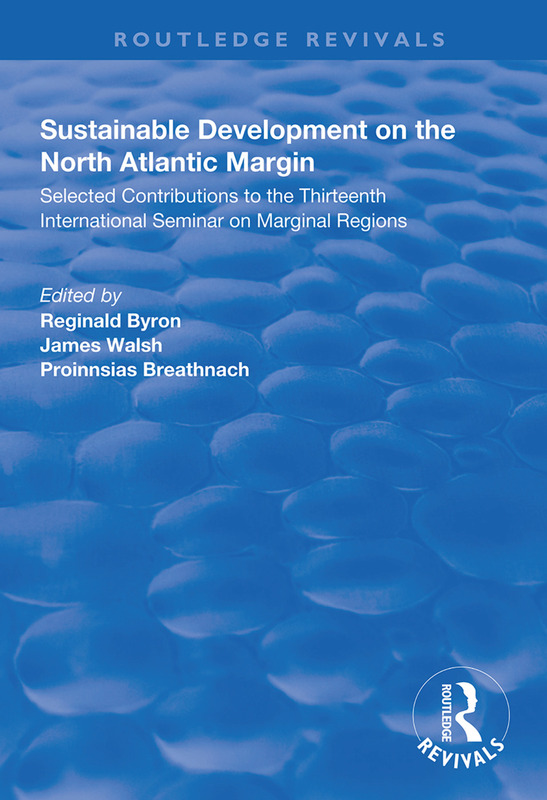 First published in 1997, this timely collection of papers takes an interdisciplinary approach to examining sustainable development in a wide range of countries such as Ireland, Norway and Wales on the North Atlantic Margin. It features specialists in geography, social anthropology, tourism, sociology, regional studies, business, municipality studies, health policy and the rural economy. The contributors argue that a free marketplace and natural-resource sustainability are not always incompatible for green policies to be successful. Part 1. Concepts, Processes and Strategies in Sustainable Development. 1. Development from Below: An Assessment of Recent Experience in Rural Ireland. James Walsh. 2. Sustainable Rural Development: Concepts, Practice and Policy. Roberto Chiesa and Patrick Commins. 3. Planning for Rural and Local Development in Ireland and Norway. Jørgen Amdam. 4. Municipal Reform: A Prerequisite for Local Development? Jens Christian Hansen. 5. Training for Rural Development in the West of Ireland. Diarmuid O Cearbhaill. Part 2. Area-Based Strategies for Sustainable Development. 6. Towards a Sustainable Approach to the Development of the West of Ireland. Micheál Ó. Cinnéide. 7. New Trends in Norwegian Regional Policies. Paul Olav Berg. 8. Norwegian Counties in a Europe of Regions. Ragnar Nordgreen. 9. Sustainable Local Development in Practice: The Case of Sykkylven. Roar Amdam. 10. The Welsh Language, Agricultural change and Sustainability. Garth Hughes, Peter Midmore and Anne-Marie Sherwood. Part 3. Sustainable Approaches to Tourism Development. 11. Environmental Interpretation as a Disciplinary Interface in Sustainable Development. Richard Prentice. 12. Eco-Tourism in Remote Areas of Norway: Just Green Veneer? Thor Flognfeldt, Jr. 13. Eco-Tourism: Rhetoric or a New Prospect for the Periphery? Peter Sjøholt. 14. A Sustainable Strategy for Scenic Landscapes. Jeanne Meldon. 15. Tourism and Alternative Employment Among Farm Families in Less-Favoured Agricultural Regions of Wales. John Hutson and David Keddie. Part 4. Sustainable Development of Agricultural Communities. 16. Farm Diversification and Sustainability: the Perceptions of Farmers and Institutions in the West of Ireland. Mary Cawley, Desmond Gillmor and Perpetua McDonagh. 17. Will Wales Stay Green in the Absence of Rural Policy? Siân Pierce, Gareth Rennie and Eifiona Thomas. 18. The Impact of Irish Dairy Industry Rationalisation on the Sustainability of Small Farming Communities. Proinnsias Breathnach and Michael Kenny. 19. Addressing the Sustainability of Rural Populations: Migration Trends in the Republic of Ireland, 1971-1991. Mary Cawley.